Issey Miyake will launch Pleats Please L'Eau, a new fragrance for women. Pleats Please L'Eau is a springtime variation on the brand's 2012 scent Pleats Please. Pleats Please L'Eau was developed by perfumer Aurelien Guichard, who also did the original Pleats Please. Notes include rose, pink pepper, neroli, white musk, cedar and patchouli. 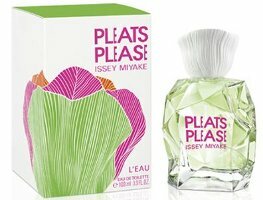 Issey Miyake Pleats Please L'Eau will be available in 30, 50 and 100 ml Eau de Toilette. It’s like a Vera Wang bottle mated with an artichoke. LOL! I like it though, I’ve liked all these PP bottles. I love the color of the juice. I’ll try it when I see it and if it is sold at Nordstrom, I know my SA will ply me with samples!